What’s the best motorized wheelbarrow? Read our buyers guide to help you decide which power wheelbarrow is right for you. We review and recommend several models that we feel are worth your money. What could be cooler than a motorized wheelbarrow? If you never knew they existed before now, this article is going to help you get to know these wonderful devices. Perhaps you’ve heard of them before and didn’t quite get what they’re all about. Also known as power wheelbarrows, these machines take the hard work out of transporting garden debris, building rubble and anything else that you might think of transporting with a wheelbarrow. Actually, you’ll be doing a whole lot more. The fact that you’re using a power-assisted wheelbarrow means that you can haul much heavier loads than you would if you’re pushing a regular wheelbarrow. A motorized wheelbarrow can load anything from around 200 LBS up to more than 700 LBS. So, how does a motorized wheelbarrow work? Most power (motorized) wheelbarrows have one or two driving wheels and one or two caster wheels that allow them to turn on a dime. Some may even have four driving wheels. Then there are motorized wheelbarrows that use tracks instead of wheels. Powered by either a gas engine or an electric motor, you have a throttle to control the power whether you’re on flat ground, an incline, or a decline. Generally, a motorized wheelbarrow will have speed settings as well the throttle to give you better control. This means that you can choose to move at a slow pace for better control over rough terrain and tight spaces or speed up for straight stretches. Their minimum speed can be anything from less than 1 MPH to a little more than 1 MPH. Their maximum speed will usually be 2-3 MPH. They also have reverse speeds, somewhere around 1-2 MPH. They usually have brakes to make stopping easier and you’re able to control the wheelbarrow on a decline – the brakes stop the wheelbarrow from running away from you when moving downhill. A motorized wheelbarrow is designed for maneuverability, with a 360° turning radius. Because of the power at your disposal, these wheelbarrows are much easier to move and turn than the old-fashioned human-powered wheelbarrows. They can handle inclines very well, with some models being better than others. One can expect to move easily up and incline up to about 15° with most power wheelbarrows. They also have much larger hoppers than conventional wheelbarrows. Hopper or load bin sizes will vary, though you should expect a capacity of 3-4 cubic feet, with some larger models being able to carry a greater volume. The hopper will be made from either durable plastic or steel. In most cases, the hopper is removable and you can use the motorized wheelbarrow as a flatbed. 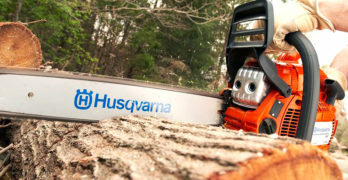 Some will have additional accessories like plow blades for clearing up your yard or building debris quickly and easily. If you’re considering buying a motorized wheelbarrow, there are some important things to consider. We’ll provide you with a buyer’s guide that will help you choose the best motorized wheelbarrow and follow this up with a review of some great options: the YARDMAX YD4103 which is a gas-powered wheelbarrow, as well as a number of battery-powered options – the Makita XUC01X1; Greenworks 40V GC40L410 and the PAW – 24 Volt Power Assist Wheelbarrow–44019. There’s that old saying: you get what you pay for. This is certainly true when it comes to a power wheelbarrow. Obviously, quality is an important factor when it comes to all equipment, though in this regard, you don’t have to worry. We’ve selected a fantastic range of motorized wheelbarrows for you to choose from. These machines have been chosen, not only for their reputation as being durable machines but also for the value they offer for your money. You could pay more and get less than what these models offer. Even among the motorized wheelbarrows that we’ve chosen to review, there’s a substantial difference in the prices of the different options. This is because there are a quite a number of differences in their specs and this guide is going to help you interpret these specs and features to help you decide which power wheelbarrow is going to be the best for your needs. Motorized wheelbarrows can be propelled in different ways. The number of wheels vary and this can be an important deciding factor. Depending on how you intend to use your motorized wheelbarrow, the number of wheels should be your first consideration as this affects the stability of the barrow as well as its ability to move on an incline and over different types of terrain. The number of wheels and how they are propelled has quite a big effect on the price. So you want to make sure that you choose a power wheelbarrow that’s up to the task that you want it for, whilst not paying more for one that is built for a heavier working environment. Single-wheeled electric wheelbarrows are the simplest of all the power wheelbarrows. They resemble a regular wheelbarrow, with a single wheel at the front and two handles with which you push or pull the wheelbarrow. The only difference being that the wheel is power assisted by a battery-powered electric motor and you have a brake lever to control the barrow on a downhill. A motorized wheelbarrow with only one wheel won’t handle too much weight – seldom more than 200 LBS. While these machines are the cheapest, they aren’t the best. Having only one wheel, means that you don’t have any stability, the wheelbarrow can easily tilt to either side and they don’t fare too well on an incline. For light-duty garden work, a single-wheeled electric wheelbarrow will take the effort out of using manual power, but won’t offer you anything more than this. Rust resistant cargo tub with 3.75 cu. ft. capacity. Two-wheeled electric wheelbarrows are a step up from the single-wheeled option and provide you with a lot more stability and traction for not much more money. It makes much better sense to go for a two-wheeled barrow, even for light-duty garden work. These wheelbarrows have two driving wheels with the same handle setup as a conventional wheelbarrow. Two driving wheels give you better traction and offer improved hill climbing abilities. Having two wheels also gives you more stability and the wheelbarrow won’t tip over very easily. We’ll be reviewing the PAW 44019 24V Power Assist Wheelbarrow as the best example in this class. Three-wheeled electric wheelbarrows are the next level up from two wheels. These motorized wheelbarrows don’t have the same type of handles, you don’t have to lift the base off the ground to move the wheelbarrow. The previous two types of wheelbarrows have static bases. So, like a conventional wheelbarrow, you have to lift the handle up so that the base doesn’t touch the ground in order to move it. A three-wheeled electric wheelbarrow has two wheels (either at the front or at the back) and a third wheel at the opposite side. They can have two driving wheels and a single caster wheel for turning or a single driving wheel and two caster wheels for turning. Some may feel that having two driving wheels is better but this isn’t always the case. A single driving wheel can be just as good (sometimes even better) if this wheel is large enough and has a good tread. Probably the most popular design for both gardening and light construction work, there are plenty of options for this class of power wheelbarrows. We’ll be reviewing two models in this category – the Makita XUC01X1 and the Greenworks 40V GC40L410. Four-wheeled motorized wheelbarrows are the ultimate when it comes to stability, control and With four wheels, these motorized wheelbarrows resemble mini tipper trucks. They can be either four-wheel drive (all-wheel drive) or two-wheel drive. Four-wheel drive will obviously give you the best traction. They will use the same zero turn action as one finds on some tractor lawn mowers. The wheel (or wheels) on one side will slow down enabling it to turn. For a 0° turn, the inside wheel (or wheels) will come to complete standstill, allowing the wheelbarrow to have the lowest turning radius. In most cases, four-wheeled motorized wheelbarrows will use a four-stroke gas engine for extra power. This means a greater load capacity – usually 600LBS and upwards. Our choice of the best four-wheeled motorized wheelbarrow has to be the YARDMAX YD4103 and this is the model that we’ll be reviewing. Motorized wheelbarrows that use tracks instead of wheels have to be the king of all power wheelbarrows. They will usually be larger than even four-wheeled motorized wheelbarrows and can handle larger loads. The biggest benefit of using tracks is in their ability to handle an incline of up to 45°. These motorized wheelbarrows will have powerful gas engines and will be much more expensive than any of the others. Because these are highly specialized heavy-duty construction machines, we won’t be focusing on this type of motorized wheelbarrow in the review. Regardless of the number of wheels and how they are propelled, one should also look at the type and size of the wheels. Larger wheels can handle rougher terrain and the type of tire tread will affect the traction. A tire with a tread that resembles that of a tractor tire will be the best for rough terrain, mud, and gravel. Whatever you use a motorized wheelbarrow for, the hopper is probably your most important factor when it comes to its usability. Many of these machines will have a removable hopper that will allow you to use the wheelbarrow as a flatbed, offering greater versatility. The volume of the hopper is measured in cubic feet. Small to mid-sized motorized wheelbarrows will have a hopper of between 3 and 4½ cubic feet. Most hoppers are made from tough plastic which won’t rust and be able to handle the rigors of garden and site work. Some may have a steel hopper which can be very durable, provided the paint is not scratched. This might be impossible if you’re using the wheelbarrow to move building debris. However, for garden work (moving plants and wood), a steel hopper can be better. When using any wheelbarrow, you’ll be tipping it regularly when emptying the hopper. The way in which the tipper works can make things easier or not – depending on the design. Single and two-wheeled motorized wheelbarrows operate like a conventional wheelbarrow. This means that you lift the handles and the wheelbarrow tilts, pivoting on the front wheel. You’ll be lifting much of the weight of the machine as well as the contents of the hopper. You’ll need some strength to do this. The handle provides leverage to assist you in tipping the weight. So the length of the handles will be quite important. Longer handles will make it easier to lift but this will also increase the height to which you have to lift the handles. Naturally, if the handles are too long you’ll have to lift them very high to fully tilt the machine. So there’s a balance between what’s practical for the average person to reach and how much assistance the leverage of the handles provide. In the case of motorized wheelbarrows that have more than two wheels or tracks, you won’t be tipping the entire machine. They’re usually too heavy to facilitate this and it’s entirely impractical. Instead, these wheelbarrows have a hopper that tilts, in the same way as a tipper truck. A well-designed hopper will have a perfect center of gravity, allowing most people to tip the bin with a single hand. Large machines that are capable of carrying a lot of weight may use electric or hydraulic motors to drive the tipping mechanism. Though even with a weight of up to 700LBS, it’s easy to tip the hopper manually because of the way they are designed. A large motorized wheelbarrow that uses a gas engine is preferable for site work and farms. If you have a particularly large yard, you may also prefer one of these machines. However, for most home users, a motorized wheelbarrow that’s too big can be a serious disadvantage. You need to consider the width of the wheelbarrow – will it be able to move along narrow pathways and between the flower beds in your garden? So, for some applications bigger and more powerful is what you need and in others, it’s wiser to go smaller. Only you can decide on this. One of the disadvantages of using a gas engine is the noise and fumes, as well as the maintenance that they require. Of course, a gas engine has no limitations on working time. Unlike batteries that only provide a certain amount of hours between charge cycles. This is another reason why gas engines are preferred by professionals, farmers and others who intend working all day with the wheelbarrow, covering a lot of distance. For most home users, battery-powered wheelbarrows that aren’t too big are the best. They’re easier to maneuver around the yard, are practically silent and require very little maintenance. Electric wheelbarrows usually use lithium-ion or deep cycle batteries with working times that vary, being anything from 1-3 hours. 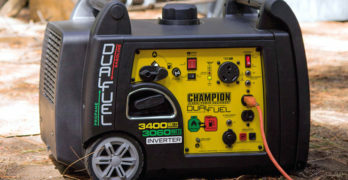 For working around the yard, the battery time is no problem. If you’re gardening for 4-5 hours, it’s highly unlikely that your wheelbarrow will be moving for more than an hour during this period. In most cases, a motorized wheelbarrow with a large enough hopper is all you might want. Though there are a few accessories that will make these machines much more versatile. A plow or scraper can be very useful for clearing an area. This allows you to use a motorized wheelbarrow as a small-scale excavator. Some may have optional load beds that that can be better suited for carrying larger objects. One can also get motorized wheelbarrows with a tow hitch, allowing you to attach a trailer to it. Having covered the basics, it’s time to review our selection of motorized wheelbarrows. The model’s chosen for this review cover a wide variety of applications from light-duty garden machines to more heavy-duty options for construction sites and farms. I have no doubt that you’ll be able to find the perfect motorized wheelbarrow for your needs and budget amongst these machines. All terrain, full-time all-wheel drive. Will turn on a dime. All terrain, full-time, self-propelled all-wheel drive. Turn on a dime with zero turn radius. Multi-speed heavy-duty transmission (3 forward speeds + reverse). One handed release to easily dump where you need it. Directional AG tires provide traction across uneven, muddy, or wet ground. Evenly balanced to maximize control and prevent tipping. This is an unstoppable little monster. With a large 4.4 cubic foot hopper and a load capacity of 660LBS (on level ground), the YardMax YD4103 is the perfect workhorse for the building contractor, farmer, or homeowner with a large yard. For smaller yards, the YardMax might not be all that practical, it’s 31.9” wide. The 208cc Briggs & Stratton engine provides a reliable powerhouse with all the power it needs to propel it. This engine is both EPA and CARB certified – you won’t have any hassles with the environment police. Power is transferred through a heavy-duty transmission with 3 forward speeds and one reverse to all four wheels. All-wheel drive, directional AG 16” X 4” tires and the fact that there are only a few inches between the front and back wheels means that YardMax YD4103 will pull through any terrain with ease. Whether you’re grinding through heavy mud or gravel, basically any terrain, the nifty YardMax is going to be an absolute pleasure. Even with a full load, it will be able to climb up a reasonable incline. One thing you might want to consider is that while these tires are the best for rough uneven terrain, mud, and gravel, they’re not great for manicured lawns. The deep tread that gives it such excellent grip will rip up the lawn. You can easily get around this, if you need to, by buying a second set of turf tires. One can buy regular trailer tires to fit the YardMax YD4103. These tires won’t give you traction for rough conditions but will let you turn on a lawn without making a mess of it. Having two sets of tires will give you the best of both worlds. So what’s the YardMax YD4103 like to use? Despite being a heavy 350LBS machine, the YardMax is nimble and easy to operate. The Briggs & Stratton engine starts with an easy pull on the recoil starter. After that, you engage the speed that you want (1, 2, 3, or reverse) and move over to the controls that are conveniently placed at the two handles. On the left, you have a clutch lever that engages to the engine to the transmission. This is really easy to operate, you simply press down on the clutch lever and hold it down to keep the wheelbarrow moving. This is a comfortable natural gripping position and won’t cause any fatigue. If you need to stop in an emergency, you simply let go with your left hand, releasing the clutch and the machine will come to an instant standstill. At the bottom of each handle is a brake lever that allows you to steer it. Pull on the left lever and the wheels on that side will stop, causing it turn left. To turn right, you pull on the right-hand lever or pull on both to slow it down or stop. This gives the motorized wheelbarrow a zero turn radius and makes it perfectly manageable on a decline. The steel hopper has a tough coating that doesn’t look like it will scratch very easily – even when loading bricks and rubble. You release the hopper with a lever and then it’s able to tilt a full 90° for emptying your cargo. Because the center of gravity is perfectly calculated, it takes very little effort to tip the hopper – even with a full load. You’re also able to get an optional plow blade accessory for the YardMax 4103 power wheelbarrow. The YardMax YD4103 is the ultimate motorized wheelbarrow for anyone looking for a fairly large machine that can handle just about anything you throw at it. 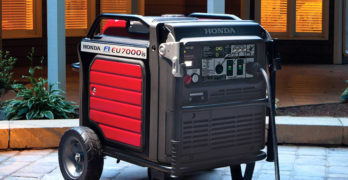 It’s tough and ready to work and comes with a 2-year residential warranty or a 90-day commercial warranty. Learn more by visiting YardMax. 2-speed with maximum speed up to 2.5 MPH on a 12º incline. Maximum load capacity up to 275 lbs. The Makita XUC01X1 isn’t all that big with a 275 LBS load capacity. Though make no mistake, this 3-wheeled motorized wheelbarrow is built as tough as they come. 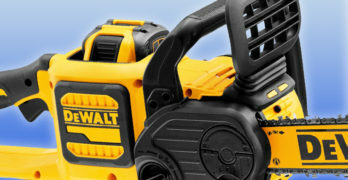 It will stand up to the roughest treatment on any job site and is also perfect for yard work. It has some amazing features that make it an incredibly versatile machine. The single driving wheel at the front is large enough to handle just about any terrain and it has excellent tread. This is powered by a brushless motor, using Makita’s 18V LXT lithium-ion batteries. It uses one battery at a time but you can use two to increase your working time. On a single battery, the Makita XUC01X1 will run for approximately 1-hour. It has two speed settings, as well as 1 reverse speed, and can reach a maximum speed of 2.5 MPH – even on 12° incline. A mechanical 7” disc brake is controlled by a lever on the handle and gives the wheelbarrow great stopping power and excellent control on a decline. Probably the most innovative design feature on the Makita XUC01X1 has to be the adjustable rear caster wheels. These wheels are attached to a super-tough adjustable frame. This means that you’re able to adjust the width of wheelbase between 19” and 30”. It can move along really narrow pathways and still have the stability of a wide wheelbase when needed. Alternatively, you can remove the caster wheels entirely and easily fit L-shaped legs. This will turn the Makita into a single-wheeled motorized wheelbarrow. As with all Makita products, this motorized wheelbarrow is designed to withstand some harsh treatment. The controls and electric components are protected by their Extreme Protection Technology (XPT), so you don’t have to worry about dust and moisture damaging the electronics. I’d say that this is quite important on an electrically powered wheelbarrow. It also has computerized controls, protecting it from over-discharging, overloading and overheating. Designed as much for ease of use as it is for durability, the Makita XUC01X1 has a tough steel frame and a steel hopper with a very durable coating. Despite the strong steel construction of this machine, it weighs only 88LBS. It’s, therefore really easy to move about and soft-grip rubber handles also help to reduce user fatigue. Something that’s rare to see on a wheelbarrow are headlights on either side, which can be very handy. It also has an optional steel flatbed for carrying bulky loads. The Makita XUC01X1 is an incredible little motorized wheelbarrow and is built to the quality standards that we’ve come to expect from this manufacturer. It comes with a 3-year warranty. Max. Load Capacity : 275 lbs. Net Weight : 87.2 lbs. Learn more by visiting the Makita site. Best motorized wheelbarrow. Beautifully designed. Capable of moving up 100 kg (220 lbs). Easily transport, haul and tow all of your yard work. Snapper XD BSRC82 Rapid Charger (sold separately) : Charges battery much quicker. Two forward and and reverse speed options (Up to 2.6 mph). Heavy-duty transmission and reinforced steel frame for added durability. ✓ View or download the MANUAL for the Snapper XD SXDUC82. Watch the video below and see for yourself how practical this self-propelled utility cart is. Snapper has done a great job of engineering a product for homeowners that will make a difference in their lives. It makes difficult back-breaking work easy and fast. Relatively speaking, it’s fairly inexpensive in comparison to the other motorized wheelbarrows in this article. If you spend a lot of time hauling stuff around your yard then it’s well worth the money. Excellent value. Will make your life easier. Homeowners who feel that the Makita is a bit on the expensive side might want to consider the Greenworks GC40L410. This 3-wheeled motorized wheelbarrow is not built as tough as the Makita, nor is it as adaptable to different working conditions. It remains a good machine for regular yard work and the price is extremely enticing. I’m sure many of you already know that Greenworks is a great brand for affordable gardening equipment with a high level of quality. This is a 3-wheeled power wheelbarrow with two driving wheels at the front and a single caster wheel at the back. The 10” wheels are a good size but are not designed for heavy mud or low traction conditions. These are turf tires and are probably a better idea for using around the garden as they won’t tear up your lawn. The large plastic hopper has a 3.75 cubic foot capacity and it will carry a load of up to 200 LBS. 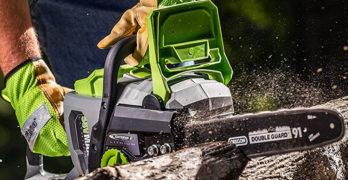 The Greenworks GC40L410 uses their 40V 4AH battery which is used in a variety of Greenworks garden tools and has proven itself to be a great battery. It only takes only 2-hours to charge and you can expect to get around 40-minutes working time from this battery. It has a large adjustable handle and a brake for the caster wheel that is foot operated. Releasing and tipping the hopper is made really easy with a release lever and a handle at the base of the hopper. It weighs only 75.8 LBS and is really easy to move around the yard. I’ll say that it’s fairly basic with a push-button forward and reverse control – that’s about it. For an easy to use motorized wheelbarrow for regular gardening, the Greenworks GC40L410 is an amazing machine at an incredible price. As with all Greenworks products, you get excellent manufacturer backup and a really impressive 4-year warranty. Perfect for hauling dirt, sod, sand, shrubs, rocks and more. ✓ View or download the MANUAL for the PAW motorized wheelbarrow. For about a little more than what you’d pay for the Greenworks power wheelbarrow, the PAW 24V (44019) model may be better for some. Even though this is a 2-wheeled motorized wheelbarrow, it has the advantage of a really large 6 cubic foot removable hopper and a really strong steel frame. It’s as simple as it gets and this means there’s very little that can go wrong. Using the two-wheel design means that you tilt it like you would a regular wheelbarrow when want to empty the hopper – by lifting the long handles that give you plenty of leverage. It has a weight capacity of 200LBS. The forward and reverse operation is done by pressing a switch and it has a variable speed control. There isn’t much more to it. The 13” wheels are a great size and turf tires mean that it won’t harm your lawn. It uses 2 sealed 12V 9AH AMG batteries connected in series. These are deep cycle batteries, designed for heavy-duty applications and should give you many years of great usage. The wide axle gives it great stability and you won’t have a hassle transporting any load. No frills, no fuss – just a tough workhorse with an incredibly simple operation. This makes the PAW 24V power wheelbarrow a hassle-free machine that is certainly going to last for some time. Though it only has a 1-year warranty (less than any of the others), I have no doubt that this motorized wheelbarrow is going to keep working for ages without giving you any problems.